I've gathered together quite a few kitchen utensil storage and organization ideas below that you might want to use in your home. Or the kind where you have to dig around looking for that specific cooking implement while the food on the stove begins to burn. While we're working on the Kitchen Cabinet & Drawer Organization Challenge this week, I thought it was the perfect time to explore some better storage solutions and organizing ideas for this type of item in your home. So, I've found some great tools you can use as well as shared before and after pictures from readers who've tackled this organizational challenge and made some great progress. Remember, the first thing to do is to declutter, so you're only organizing and storing what you need and will use, not just stuff you've not used for years, and won't in the future either. If you need more help with this step, check out my article about how to declutter kitchen utensils and gadgets here. I hope these ideas inspire you! 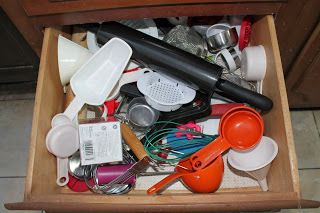 Once you've gotten your cooking tools decluttered and organized you can share your before and after pictures with me here and I'll the best ones to the page. Homemade Drawer Dividers Work Great! 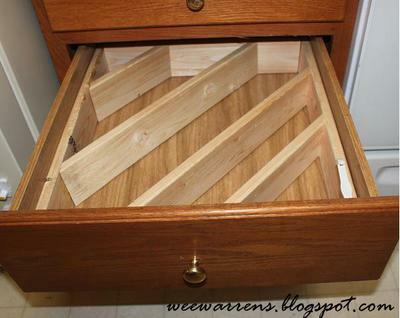 A reader, Judy, shared these pictures of how she organized her drawer, and she did it by making her own drawer dividers. 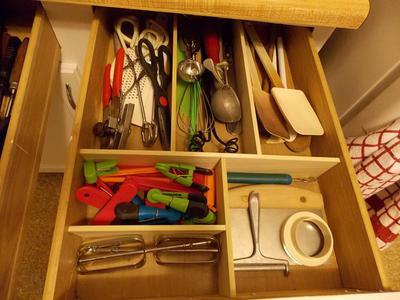 She explained: "I recently made dividers for some of my utensil drawers. I know it looks strange having the handles toward the back of the drawer, but it is easier to choose the right utensil when you are not just looking at handles." If you feel like a confident do it yourselfer (is that a word?) this can be a great option for you, instead of buying them premade. Judy explains: "And they were a lot cheaper!! You'd be surprised how little it cost. I think the pieces of wood were something like $1.50 for 2 1/2 " x 20+" at Lowe's. Just figured how I wanted the drawers laid out, hubby cut the pieces the size I wanted, and I glued them in with wood glue. Probably did 4 drawers for what one divider would cost at IKEA--if we had one here." In addition, another reader, Dawn asked Judy a question on the Facebook page about drawer liners. Dawn asked: "Ok when putting in the dividers, which is a fabulous idea, did you use any sort of liner for easy wiping out when it comes time to tidy up the drawers? Just wondering. 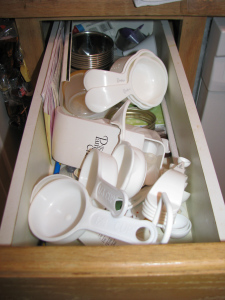 I need to add some drawer liners to both kitchen drawers and bedroom dresser drawers." 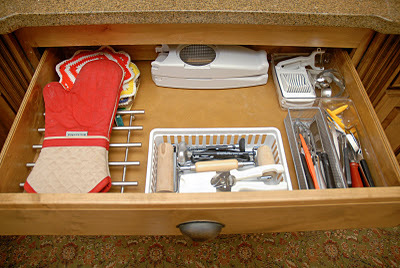 Judy responded: "I didn't use any liners in the 2 drawers shown, but I did in the knife drawer and the silverware drawer. I'm sure a vacuum attachment would work great to get the crumbs/whatever accumulates out, then just wipe." If you don't want to make your own dividers like Judy did, you can easily buy them and install for a similar look. 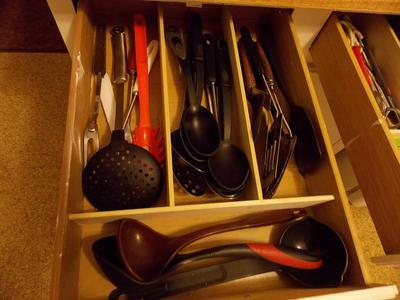 Many people use drawers to hold their kitchen utensils, but you don't have to. If you cook a lot and have an adequate amount of counter space a good way to hold them is in a cute vessel, pitcher, or holder of some type, so they're always ready to grab and use. The one pictured above is handmade, but there are lots of deep vessels you can use for the purpose. Just choose something that matches your kitchen decor since it will be sitting out all the time. I've created a whole additional page about utensil crocks and holders if you'd like even more ideas on this method for storing them. Kelly shared this picture of how she's dealt with the fact that she doesn't have a lot of extra storage space for gadgets, but that her husband is rather addicted to buying them. 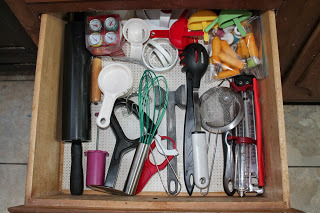 She says: "My husband loves kitchen gadgets and tools but my drawers were to disorganized so this is what I did." This is such a great idea, and wonderful for those who have neither drawer nor counter space. I can't tell for sure but it looks like she used Command Hooks (see item to the right), or a similar product, to stick the hooks onto her cabinet door. I like this idea a lot, but when I shared it with readers they pointed out some things to consider before doing it, which I thought were valid things to be considered so I'm adding this information here. First, these items will swing around when you open and close the cabinet door. This may be no big deal for you, or for others it might drive you nuts. For example, Terri said: "Terri says: I did this and took it down after a week or so. The banging and clanging drove me nuts." I saw the idea of hanging kitchen utensils on the inside of the cabinet door with a warning that the noise may drive you nuts. I loved the idea, but after hanging only two of the spoons I could tell the noise would be too much. Therefore, I decided to put additional hooks on each side of the inside of the door and attach a rubber band between the hooks to go across the spoons and hold them against the door. It worked great!! No more swinging and banging! In addition, if you look in the picture Kelly has slightly recessed shelves. That means that the shelves don't quite touch the cabinet door. If your shelves touch your cabinet door and these utensils are hanging there the cabinet door will not close all the way. Make sure to check this out before choosing this option. A couple of readers also shared, when they saw this picture, that they did something similar with their measuring cups and spoons. This is brilliant, and if positioned correctly you can even do this if you don't have recessed shelves. For example, Kathy says: I have done this with my measuring cups and spoons. Hanging them in order makes it easy to grab the right size. Leah says: I did this awhile ago with my measure spoons and cups. I'm sure I'll use it for other stuff in the future too. It's a brilliant option for clearing up drawer space and not spending countless minutes searching for items. Another idea, if both drawer space and counter space is at a premium in your kitchen, is to hang an organizer on the wall which you can put large utensils and cooking implements on. This has obvious advantages, because you have more room to store other items in other places in your kitchen, and are using otherwise most likely unusable space. However, you do need to keep all these items looking pretty if they will be displayed this way. It won't look as pretty once some of this stuff is bent, dirty from constant use, etc. But if you cook a lot and have really nice cooking implements that you do want to show off this can be a great alternative for you. 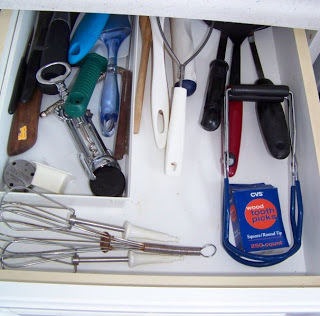 Leigh from Joy and Strength shared before and after pictures of her utensil drawer. It had originally also held the spices, but she separated out the drawers so there was more room for each type of item. 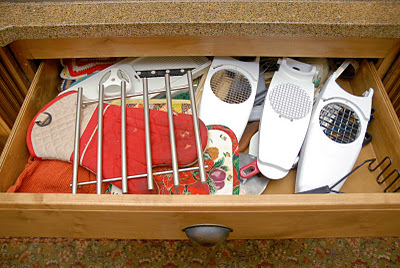 She said: "Now that the cooking utensils had a drawer to themselves I had the perfect spot for my potholders etc. 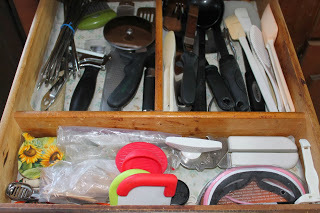 I made a utensil organizer by cutting the sides off cereal boxes & taping them together." Basically, she made her own dividers so things didn't slide around in the drawer, which is a great way to keep things from getting disorganized. Bec from 2012 - The Year Of Challenges shared her before and after pictures. Clearly she just decluttered the drawer she housed everything in, but didn't add any organizers. The thing is, you can tell it already made a huge difference. She said: "I've removed some things but it still looks messy -and the scary thing is I cleaned this one out in November!" This just means you've got to regularly go back and do some upkeep in this area, to keep everything functioning properly, since you use cooking implements so frequently in your home. Susan at Camp Slinkard organized her kitchen utensil drawer. She said: "I decided to tackle the drawer immediately under our cook top. It houses pot holders, oven mitts, and a variety of other kitchen paraphernalia. It was a hot mess, truthfully…"
"I pulled everything out, grabbed a few extra sorting trays I happened to have hanging out in the utility room, and within about 30 minutes, the drawer looked like this…"
My husband made a wonderful diagonal drawer divider insert to keep large untensils organized in the drawer (and off the counter). I blogged about it (including a tutorial) at here at my blog, Wee Warrens. Oh this is so completely awesome! This is great for those longer handled items that don't fit as well otherwise. It's great to have a handy husband. And thanks for mentioning the 52 Week Organized Home Challenge within your post! 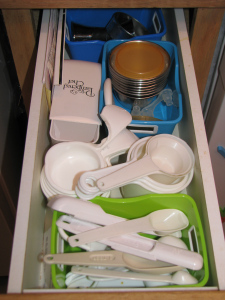 Lee-Anne from Life In A Peanut Free Shell shared before and afters of her two utensil drawers. She says of the first before picture: "Here’s the before – crazy! Can you find our meat thermometer? I can’t!." Then, she explained what she did for the first drawer, which was: "I went to Dollarama and bought a bunch of bins for the drawers to help organize things. Plus, we have most of the extra utensils on the counter in 3 separate canisters (an idea I got off of Pinterest – one each for baking, serving and cooking). Doing that freed up so much space in our drawers! And with only having 4 drawers, space was at a premium!" Organizing and storage solutions don't have to be expensive. In fact, one of the best places to check first for little containers is a dollar type store. They often have great stuff for low cost! 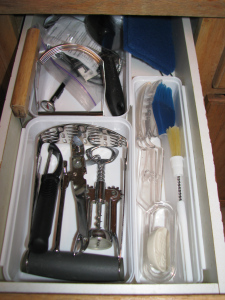 Reecea from Fresh Juniper shared an after picture of a newly created drawer to hold some of her utensils. It had previously been a junk drawer that she had decluttered. She explained, "Junk drawer number 2 was right next to the refrigerator and in the center of our food cabinets. We don't really have a pantry. Following Taylor's advice we put the ice cream scoop and the cheese slicer here close to the refrigerator. Also the canned goods are all over here so it was time to move the can opener over here. Finally, the flour and sugar is here, so the dry measuring cup is in here too. Just makes so much more sense than having all of these things on the opposite side of the kitchen like we did before. I think the pink paper looks cute with the white divider bins and the ice cream scoop." Cleaning Out The Drawers Made Quite A Difference! 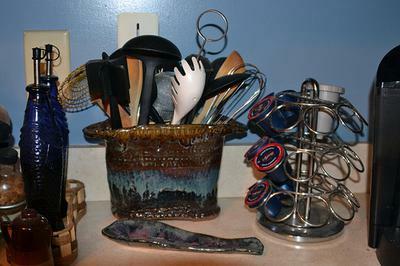 Angela from Confessions of a Craft Addict did the utensil decluttering mission, and shared both her before and after pictures. She explained, "I am constantly getting new kitchen gadgets. I love gadgets! 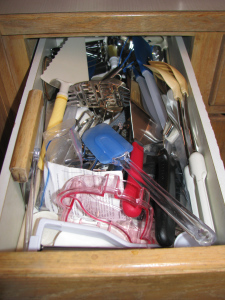 But sometimes a good purge of the utensil drawer is necessary." Angela actually has two drawers devoted to her gadgets, plus a on the counter canister (not pictured here, but you can check out her blog post, link above for pictures of this). She said, "I went through and got rid of a bunch of junk. Anything broken, stained, or starting to melt went in the garbage. The rest of the stuff I got rid of went to Goodwill. It made a huge difference just cleaning out those drawers!" 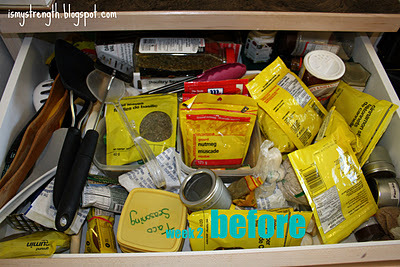 Tina shared her before and after pictures of this drawer. She said of the after picture, "I need a few more cubbies/baskets for this drawer." I would agree Tina, although this is fine the way it is also. However, more dividers of some sort will keep things from shifting around too much and help you find things easier when you're in the midst of cooking. 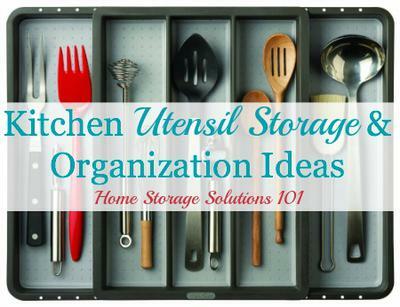 I hope these ideas from real people have inspired you to get your kitchen utensils organized and decluttered today. You can join us in getting your whole home organized, room by room, item by item, in the 52 Week Organized Home Challenge. 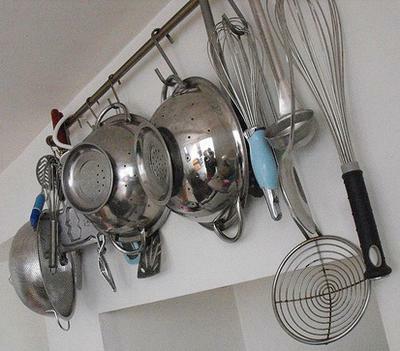 Further, if you've decluttered your cooking utensils as part of the Declutter 365 Missions make sure to show your before and after pictures and I'll feature the best ones on the site! You can share your kitchen decluttering accomplishments here. 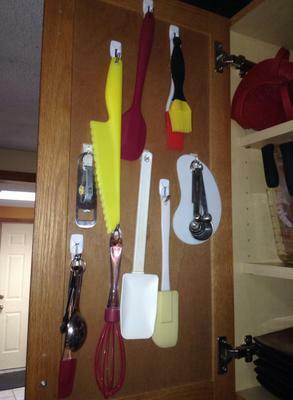 Putting Command hooks on the inside of a cabinet door lets you hang your measuring spoons and cups. Easy to find the one you want that way. 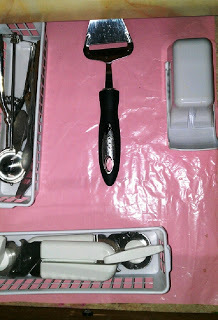 I recently bought some bins at the dollar store for my smaller utensils like can opener, cheese slicer, pizza cutter etc. I love having everything contained! Would not have thought of putting handles backward. My problem is I have limited counter space in addition to only two small drawers in my kitchen! Smoki, do you think a hanging rack would work for you, either from the ceiling or on a wall? Perhaps even a suspended drawer, which could be lowered for access and raised when not in use. Just thinking off the top of my head here, your problem is quite a dilemma. Best wishes!! Wow, never would have thought of the diagonal storage! Love, love, LOVE it!! Planning/hoping to do this soon, as it's very needed (plus I want to do it before DH decides to -- I tend to lose stuff when HE declutters!). I store my measuring spoons in an empty Crystal Light container (the ones that come with packets that make 2 quarts). My dad made interlocking drawer divider walls that exactly fit the drawer so they don't budge. To clean I take them out and apart. Both they and the drawer are then flat and easy to clean. My dad is a genius. Be careful with spring loaded drawer dividers! 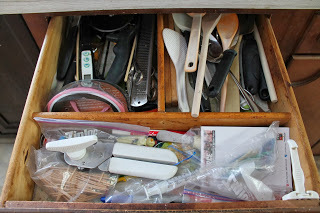 I purchased the adjustable spring-loaded wood drawer dividers and did what I thought was a great job sorting and organizing a fairly large drawer for all me assorted utensils. Well, the pressure of the spring loaded drawer put so much stress on the drawer, that the entire drawer just sort of exploded one day when I pulled it out. The drawer was so damaged I had to purchase a new one, which cost a fair amount of money! I will never again put those spring loaded drawer dividers in a drawer again! I always find nice and inexpensive organizers in stores like Marshalls and Ross. I purchased 3 glass jugs. They sit on the bench at a convenient distance from the cooker. They contain all my cooking utensils. So if I suddenly need my whisk I am not wrestling it out of a drawer full of knives, wooden spoons, spatulas etc. Been using this system for at least 10 years. Sorry. I am not clever enough to send a photo. 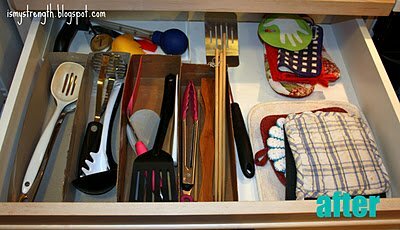 Another great solution for cooking utensils are drawer dividers. That way you can customize how much room you may need. This has helped immensely for my cooking spoons and such. I also keep all the plastic spoons and things separate from my utensil drawer in another drawer along with measuring spoons and such. It keeps things very tidy. Great decluttering ideas. Thanks heaps. 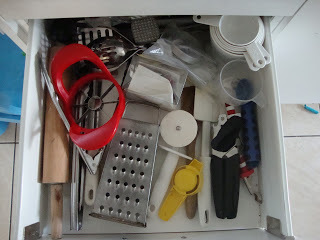 Can people post some storage for those big utensils that I have traditionally kept in the 2nd drawer? Growing up we had 4 drawers. Keep up the good work as will I. Instead of putting the hooks on the back of the cabinet door where they can fall off/make noise every time you open the door, put the hooks on the inside of the cabinet itself - I've done this for my measuring cups & spoons and it works REALLY well. I have a small kitchen with very few drawers. The one I'm able to use for cooking utensils and gadgets is only 7-3/4" wide, but 6-1/2" deep. It ends up like a black hole - things make their way to the bottom never to be found again. It would be wonderful to have 2 layers of organized, accessible tools. Any ideas for a narrow deep drawer? I have 2 Pampered Chef Tool TurnAbouts that I put on either side of my stove. One for all the spatulas, mashers, large ladles, and serving spatulas, etc. the other for the rubber spatulas and all the must haves like peelers, corers, small pairing knives and bamboo tongs. I love this setup. They are things I use every day cooking. Very handy. 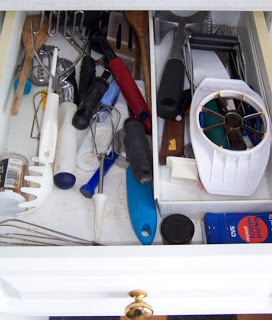 Great idea about vacuuming the cutlery drawer to get those pesky crumbs when you don't have time for a full empty and clean. My sister had a cutlery tray that had a second layer half size, lengthwise that fit and moved across half of the tray. I don't know where she got it, but having a double decker cutlery tray would beat diving into a deep drawer! I am also a person who likes kitchen gadgets. A couple of months ago I took a plastic box with a lid. I went through all the gadgets in the drawer. If I was unsure about keeping it, I put it in the box. When I was finished, I put the box on a shelf in the garage. 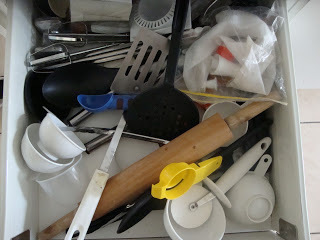 Any item I took out and used would go back in the utensil drawer. So far I have used none! That entire box will be donated very soon.